This book is not for everyone, but for anyone who enjoys a well-structured, deeper literary and theological approach to sharing the gospel, this book is a treasure. 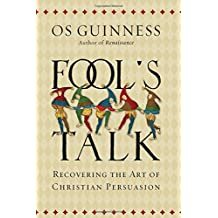 Guinness urges that we can better share our faith if we know and love the person(s) with whom we share, sharpen our skills of persuasion and use techniques that take by surprise rather than hit head on – things such as skillful use of question and storytelling, for example. Very helpful.